The release of some 91,000 secret U.S. military documents on the Afghanistan war is just the beginning, WikiLeaks founder Julian Assange promised Monday, adding that he still has thousands more Afghan files to post online. The White House, Britain and Pakistan have all condemned the online whistle-blowing group's release Sunday of the classified documents, one of the largest unauthorized disclosures in military history. The Afghan government in Kabul said it was "shocked" at the release but insisted most of the information was not new. It was unclear what kind of an investigation the U.S. might pursue. Assange said he wasn't surprised by the White House's condemnation of the leak. He said the U.S. government, like other scrutinized subjects, seeks to "criticize the messenger to detract from the power of the message." He also rejected the notion that the leak would pose a security risk for the United States, saying that the material is more than seven months old and had no "operational consequence." The documents cover some known aspects of the troubled nine-year conflict: U.S. special operations forces have targeted militants without trial, Afghans have been killed by accident, and U.S. officials have been infuriated by alleged Pakistani intelligence cooperation with the very insurgent groups bent on killing Americans. Still, they also included unreported incidents of Afghan civilian killings and covert operations against Taliban figures. The revelations about frequent, concealed and needles civilian deaths came Monday as Afghanistan president Hamid Karzai said a NATO rocket attack killed 52 civilians in the south of the country on Friday. Karzai said the Afghan intelligence service determined that a NATO rocket hit Regi village in Helmand province's Sangin district. The dead included women and children. Karzai condemned the attack. Assange told reporters in London that what's been reported so far on the leaked documents has "only scratched the surface" and said some 15,000 files on Afghanistan are still being vetted by his organization. He said he believed that "thousands" of U.S. attacks in Afghanistan could be investigated for evidence of war crimes, although he acknowledged that such claims would have to be tested in court. "It is up to a court to decide really if something in the end is a crime," he said. Pakistani Officials: WikiLeaks Claims "Outrageous"
Assange pointed in particular to a deadly missile strike ordered by Taskforce 373, a unit allegedly charged with hunting down and killing senior Taliban targets. He said there was also evidence of cover-ups when civilians were killed, including what he called a suspiciously high number of casualties that U.S. forces attributed to ricochet wounds. Still, Assange said there was no one revelation that stood out over others. "The real story of this material is that it's war," he said. "One damn thing after another." White House national security adviser Gen. Jim Jones said the release of the documents "put the lives of Americans and our partners at risk." In a statement, he took pains to point out that the documents describe a period from January 2004 to December 2009, mostly during the administration of President George W. Bush. Jones noted that time period was before President Obama announced a new strategy. Pakistan's Ambassador Husain Haqqani agreed, saying the documents "do not reflect the current on-ground realities," in which his country and Washington are "jointly endeavoring to defeat al Qaeda and its Taliban allies." The U.S. and Pakistan assigned teams of analysts to read the records online to assess whether sources or locations were at risk. Pakistan's powerful spy agency, Inter-Services Intelligence, said Monday that the accusations it had close connections to Taliban militants were malicious and unsubstantiated. A senior ISI official said they were from unverified raw intelligence reports and were meant to impugn the reputation of the spy agency. He spoke on condition of anonymity in line with the agency's policy. Hamid Gul, a former head of the ISI who is mentioned many times in the documents, also denied allegations that he'd worked with the insurgents. The New York Times said the documents reveal that only a short time ago, there was far less harmony in U.S. and Pakistani exchanges. The Times says the "raw intelligence assessments" by lower level military officers suggest that Pakistan "allows representatives of its spy service to meet directly with the Taliban in secret strategy sessions to organize networks of militant groups that fight against American soldiers in Afghanistan, and even hatch plots to assassinate Afghan leaders." The Guardian, however, interpreted the documents differently, saying they "fail to provide a convincing smoking gun" for complicity between the Pakistan intelligence services and the Taliban. The most revealing point in the leaked documents, according to The Guardian's correspondent in Afghanistan, are inter-military communications which cite the use of heat-seeking missiles to down coalition aircraft. Taliban militants have been rumored to possess such weapons, but their use has never been confirmed by the U.S. military or NATO. CBS News chief foreign affairs correspondent Lara Logan first reported in October 2009 that U.S. intelligence officials believed Iran was supplying surface-to-air missiles to the Taliban - the very same weapons the U.S. supplied to the Afghan resistance to bring down the Russians during that country's failed invasion. The leaked records include detailed descriptions of raids carried out by a secretive U.S. special operations unit called Task Force 373 against what U.S. officials considered high-value insurgent and terrorist targets. Some of the raids resulted in unintended killings of Afghan civilians, according to the documentation. During the targeting and killing of Libyan fighter Abu Laith al-Libi, described in the documents as a senior al Qaeda military commander, the death tally was reported as six enemy fighters and seven noncombatants - all children. Task Force 373 selected its targets from 2,000 senior Taliban and al Qaeda figures posted on a "kill or capture" list, known as JPEL, the Joint Prioritized Effects List, the Guardian said. CBS News correspondent Mandy Clark reports that many of the revelations in the leaked documents come as little surprise, but serve to clarify what is often a murky picture of the war on the ground. Clark reports that while anger among the Afghan population was already high over the use of drone strikes and the civilian casualties that can occur with them, the details revealed by Wikilieaks will likley stoke that anger and leave many with doubts that the problems are being efficiently addressed. U.S. government agencies have been bracing for the deluge of classified documents since the leak of helicopter cockpit video of a 2007 firefight in Baghdad. In the video, a helicopter gunner repeatedly asks permission to open fire on a group of people standing in the square and is told to "light 'em all up" and then to "keep shootin'." The shooter guns down two Reuters journalists and later opens fire on a van that came to assist the wounded and dead, wounding two children. A voice on the radio repeatedly says "nice" after the shooting. That release was blamed on a U.S. Army intelligence analyst, Spc. Bradley Manning, 22, of Potomac, Md. He was charged with releasing classified information earlier this month. Manning had bragged online that he downloaded 260,000 classified U.S. cables and transmitted them to WikiLeaks.org. U.S. officials have also publicly declared that they have tried to hunt down Assange. Assange on Monday compared the impact of the released material to the opening of the East German secret police archives. "This is the equivalent of opening the Stasi archives," he said. He also said his group had many more documents on other subjects, including files on countries from across the globe. "We have built up an enormous backlog of whistleblower disclosures," he said. 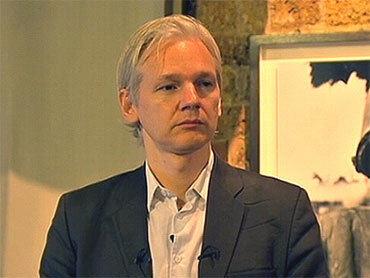 Assange said that he believed more material would flood amid the blaze of publicity. "It is our experience that courage is contagious," he said. "Sources are encouraged by the opportunities that they see before them."